A customer recently ordered a lugged steel Davidson to be completely chromed, something like a first for Davidsons. We wanted to use JP Weigle’s Frame Saver, a rustproofing treatment, on the insides of all the tubes, but the seat stay vent holes are particularly small and difficult to get to. Ordinarily one sprays Frame Saver aerosol can through one of those slim straws, but that invariably requires some clean up. The decals had already been applied to the frame and we were worried what the Frame Saver might do to them. 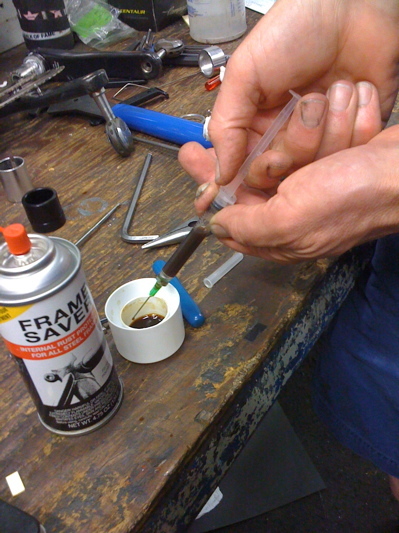 So Bill shows up with a hypodermic needle and syringe with which we mainlined those seat stays. Back before the Weigle marketed his Frame Saver product, one would use something like linseed oil to coat the insides of a steel frame. 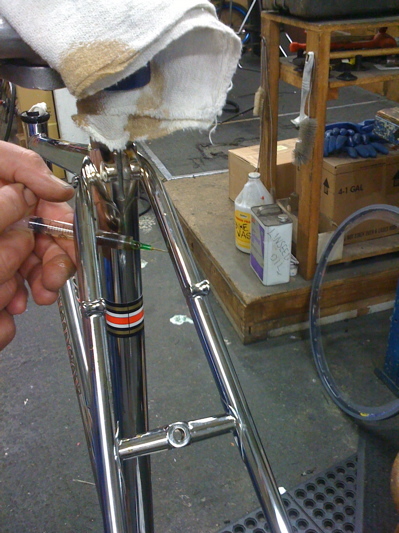 I did that twice with my Bianchi EL/OS, and let me assure you that is one messy, smelly job. And linseed oil can take months to fully dry. Unsurprisingly, Weigle’s Frame Saver is THE choice for protecting your fine steel frames nowadays.